My previous post left people hanging. This will conclude the story. I hope. The good news is that I got my FiOS service. Works as advertised. 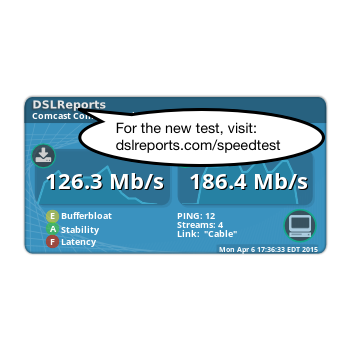 A test from my home in Montgomery County, MD to a well-regarded speed testing server in NJ showed Verizon exceeded the promised 15/5 speed. (See pic below.) And this was at 10pm in the evening, a prime-time for internet usage. - While the technician showed up on time, the fiber did not! So the technician pulled out a spare coil and laid it across my neighbor's front yard. (Fortunately, we're on good speaking terms.) As the tech was finishing up, the contractor showed up to lay the fiber. This required 400' of hand trenching so the tech declined to stick around and said he would come back to finish up and remove the fiber laying on the ground. (Note: it's now been 3 days and my connection is still using the unburied fiber rather than the buried fiber. Google for "cable across lawn" to read many complaints about subscribers who had cable left on their lawns; some people report cables draped across their lawn for 6 months!) I suppose I should say I appreciate Verizon being willing to pay for two truck rolls. But this is not a good sign. Can't Verizon coordinate scheduling with their contractors? - The promised install window that expanded from 4 hours to 8 hours and finally 10 hours was absurd. The tech finished up in 2.5 hours, primarily because all I required was internet. The technician agreed that the scheduling software gave me a window as large as might be necessary for triple play service but should have been smart enough to know that wasn't happening. And the scheduler should have known that I was the first visit in the technician's day. So why give me a 4-hour arrival window? Because of that I ended up rescheduling the Verizon visit unnecessarily. - While the technician was friendly and happily answered all my questions, he did overlook one thing. Only as he was showing me his completed work and we were exiting the room did I turn out the lights - and kill the network! Yes, he had wired the battery backup to a socket controlled by a wall switch - a switch next to another for the room lights. Well at least we verified the battery backup worked. Speaking of which, I really do NOT want to hear an alarm. (Pepco's electric service is much too unreliable for me to want to hear an alarm every time the power goes out.) Is there a way to silence it for good? There's an Alarm Silence button on the unit but that does not silence the outage alarm. Back to the original issue - clearly, the technician should have tested the socket beforehand. I didn't like the final arrangement but told him I could live with it. He offered me some electrical tape to cover the switch, sigh. I told him I would pay the $2 for a switch guard - made for this very purpose. He remarked that he had never heard of such things! - Verizon continues to be confirmation crazy. At the Verizon portal, it offers to save my id and password but only for two weeks. Why just two weeks? And each time I use the e-chat at verizon.com, the representatives at the other end start by insisting I re-enter my name, address, and phone "just to confirm it is you" even though I already had to enter my username and password to get as far as the e-chat link! Indeed, the e-chat starts by providing my authenticated identification to the representative - why do they insist I enter it again each time? What was the point of offering to save my username and password for two weeks if the representatives are ignoring this info every time? - Every time I log in to Verizon's web portal, I am presented with ads. As if that's not annoying to begin with, the ads are animated so while I'm trying to focus on one part of the page, I see these things constantly moving out of the corner of my eye making for a distracted experience. (I'm paying for service and still have to receive ads?!) I tried the "customize" link and attempted to disable everything. Yet Verizon still presents me with ads and "features" that I've specifically declined. - I tried to use Verizon's TV Online but found it restricted to TV customers. I'm not trying to get something for free. Rather, I already watch TV through sites like Hulu. It would be cheaper for Verizon to provide the same content to me directly (to reduce their internet bandwidth) plus Verizon would show me its commercials rather than letting Hulu's commercials appear. Indeed, Comcast allowed me to view their online TV services so it's surprising that Verizon does not. Back to Hulu for me. - There are bugs and misfeatures in their website. (After 6 years?) Look at the snapshot below and what do you see? First, there's an obvious bug being reported at the bottom of the pic. But it's a server bug so it makes no sense to report it to me. Don't Verizon's website programmers know the basics of error reporting? (And the diagnostic is cut off mid-character exactly the way it appears here!) But there's another issue - look at the top of the picture. It's showing information for both new customers and old customers. Why? The system knows which kind I am - it shouldn't offer me a choice for something that can't possibly apply to me. I'm tempted to make a joke here about programmers not knowing about programmability but this is probably more the fault of the website designer. Taken together with the ads, the whole experience of the portal is simply horrid. Fortunately, I believe I have everything set up so I should never need to revisit it. - I have now received two emails thanking me for enrolling in Verizon Paper Free Billing. Only problem is: I didn't sign up. I recall seeing a checkbox for it earlier that I carefully unchecked. Either Verizon ignored my checkbox or snuck another into one of these many confirmation screens they have been throwing at me. It took some puzzling to figure out to how to de-enroll (in Verizon-speak) from Paper Free Billing; Verizon certainly didn't make it easy to do. The last step was to say why I wanted to de-enroll. My answer would be longer than the one-line entry field Verizon's form allows. For starters, Paper Free Billing only keeps a record of 2 years of billing. I want more. With paper, I get control over how long to retain the bills. Plus, I know the bills can't change format or content. Yes, I can save them and even print them out each month but why should I have to? Why can't Verizon give me both electronic and paper? (Even Pepco does that.) Having both would allow me to compare the bills (electronic vs paper), the billing cycles, the ease of access, and so on for awhile. Perhaps Verizon could convince me that I can rely on their electronic records. But for now, I don't trust them and they're not giving me an opportunity to earn that trust. (That they sent two emails alarms me too. Is their email system that unreliable?) So for now, no paper-free billing. Lastly, yes, I did call Comcast to stop service. I was startled to hear the representative ask if I would like a better rate. It's a little late for that. Maybe next year. Don - glad to know that you have finally gotten FIOS (for-better-or- worse)! The problem you had with the technician is so typical of so many of them: the plumber, the electrician, the landscaper, the roofer, the bank teller, etc. They are generally poorly trained on top of "overworked", "underpaid" and uncaring. However, the "cable across the lawn" problem would not exist if more people would officially complain. This is a "trip hazard" and Comcast, Verizon, AT&T, etc, could be sued if someone got hurt. From my experience, it just takes a phone call to remind them of that. Their response is immediate! Anxious to hear how well your FIOS service works out. I might go FIOS if it does.